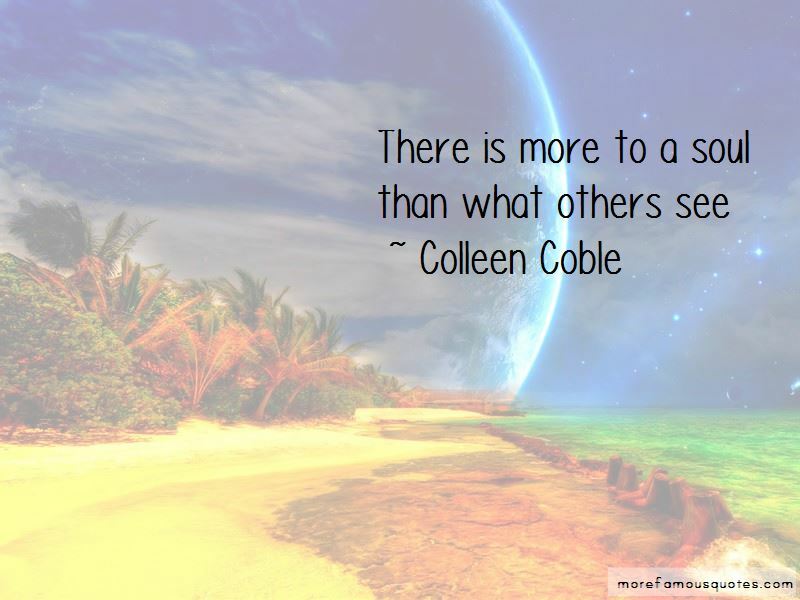 Enjoy the top 48 famous quotes, sayings and quotations by Colleen Coble. God was in the business of bringing blessings out of unexpected circumstances, but Lucy didn't want this twist to her life. ... but didn't God ask the seemingly impossible at times? Struggle and pain aren't something to fear. We will all face trials while here on earth. What matters is how we're dealing with the challenges that come our way. Do we let them mold us into stronger, better people, or do we grouse and complain about our lot in life? “The horses came thundering toward Margaret. "Get down!" Daniel tackled her to the dusty ground. The breath puffed out of her. She struggled to free herself, but his strong body kept her pinned beneath him. She could smell the clean scent of soap underneath the scent of his skin. Margaret is the most beautiful woman I've laid eyes on. The men in this county must be crazy not to see that. I can't impose on my friends for too long. I'm not sure what to do." He tipped her face up and brushed a kiss across her lips. "You'll marry me, of course. As soon as it can be arranged." Her pulse skipped, and she pulled back. "Right away?" His eyes were smiling and full of love. "I'd marry you tomorrow if we could arrange it that quickly." The thought of being a family with him and Edward brought heat rushing to her cheeks. "I'd like that more than anything in the world," she said. "Tell me what to do and I'll arrange it." "There are so many things to do, I don't know where to start," she said, laughing. The smile left his face. "When, my love?" The possessiveness in his voice heated her cheeks even more. "I need at least two weeks. I have to make a dress." "I'll buy you one." "I want to make it. I'll only have one wedding day. For a moment, the color leeched from his face, then he blinked and smiled. Margaret, for a second I thought it was your mama standing there. He gave a gruff laugh. You look lovely, my dear. Her father's praise brought tears to her eyes. His approving words came far too infrequently. Was her appearance all that mattered to him-to anyone? It seemed to be the way of the world. No one cared about who she was on the inside. No one saw the heart longing to be loved and to love in return. She sometimes even doubted God's love for her. “Daniel's chocolate eyes studied her, and a wave of heat stung her cheeks. What did he think? He said nothing, just raked her with a gaze that made her feel self-conscious and gangly. When he reached the yard, he found Edward with Addie and her dog under a redwood tree. She was lying on her back with her slippers resting on the trunk. Edward's head was on her stomach, and the dog lay with its head on its paws. Her hair hung from its pins, and his eyes traced the silken strands looped on the grass. "My nymph," he said. She jerked to an upright position and began tucking her hair back into its proper position. Though she sprang to her feet, bits of mud and grass clung to her skirt as a reminder of the unladylike position in which he'd found her. His smile broadened. He stood and stepped up behind her. Why not? It's the truth. I like spending time with you. You're strong, beautiful and brave. What more could a man ask for? “Daniel studied her face. Have you ever thanked God for giving you the advantages he has? Advantages? 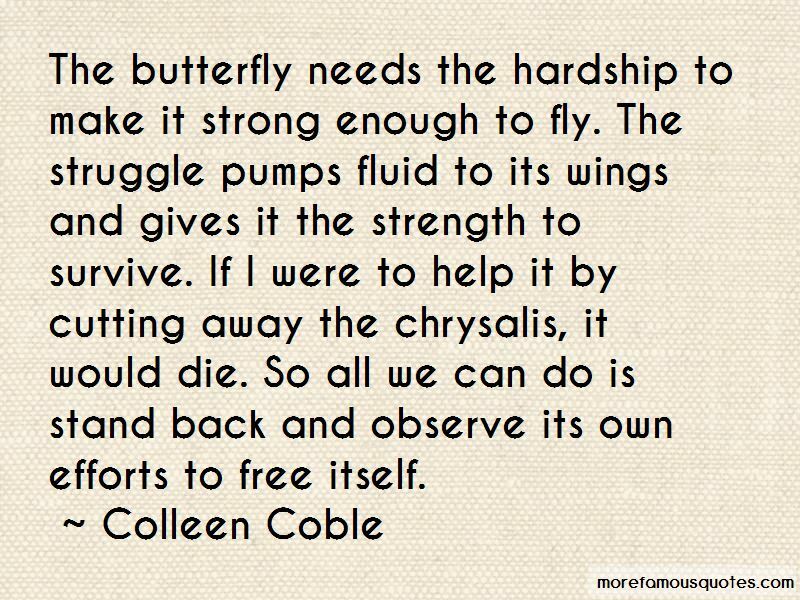 Want to see more pictures of Colleen Coble quotes? 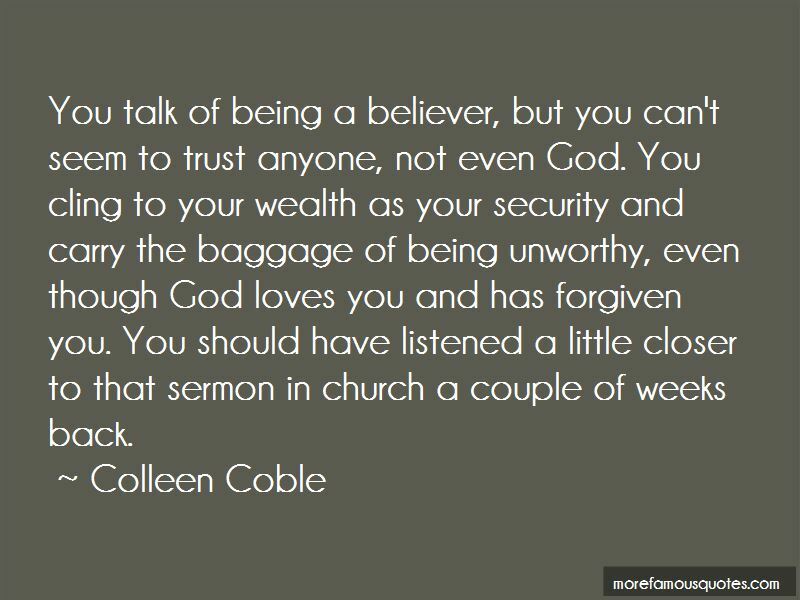 Click on image of Colleen Coble quotes to view full size.